This team color Navy New England Patriots Mens Dual Threat Long Sleeve T Shirt by Majestic shouts out that you are a NFL fan and proud to show your team pride. With its 7.2 oz. 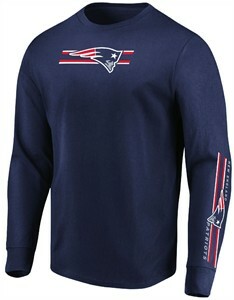 mid-weight 100% cotton standard-fit body that works as an outer-layer you will be ready for cool weather on Patriots game day with front screened team graphic and a left sleeve graphic.